"Remote from what was to be known as the ‘Battle of Lake Comacchio’, this author did not have a clue as to what was happening to his friends in No. 2 Commando. He had been inside Germany for some time and way out of touch. It seems that No. 2 Commando had been joined by No. 9 Commando and Nos. 40 and 43 R.M. Commando to implement the task of grabbing a spit of land which extended from Lake Comacchio to the Adriatic Sea, with further exploitation northwards envisaged in the minds of the ‘planners’. What transpired is that No. 2 jumped off as scheduled at 7:00 p.m. on April 1st, 1945 and lugged and tugged and humped their boats across the few inches of water topping a layer of oozy slime that comprised Lake Comacchio. It was not until 5:00 a.m. the next morning that they landed on the opposite shore, approached the enemy from the rear and engaged in an attack on everything in a German uniform. The ensuing operations by all the Commando units present resulted in all their ‘specified’ objectives being achieved, with the whole enemy forces south of Porto Garibaldi being captured or destroyed. As there were many casualties noted after the day of April 17th, 1945, it seems that the fighting went on until a little beyond that date, after which No. 2 Commando retired to its former assembly area at Ravenna. The German forces in Italy and Austria surrendered on May 2nd, 1945 and No. 2 Commando had fired its last shot. 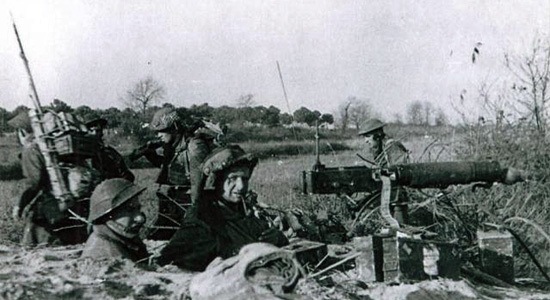 A very long time after the Lake Comacchio battle had gone into history as a ‘Battle Honour’ for the Commandos, this author must make the names of No. 2 Commando ‘fallen’ part of the Commando history. Looking backwards to those times, this author wonders about what times of sorrow must have been the lot of the families of those men who had fallen within days of the war’s ending. How muted their celebrations of V.E. Day must have been! " nb. The above account is part of the overall history of No 2 Commando by Bob Bishop No 2 Cdo.